Ashwagandha (Withaniasomnifera) is the most popular and commonly used herb in Ayurvedic medications and is one of the herbs with high rejuvenating powers. It is found commonly in India and North America. It is in other words called the natural stress buster due to its ability in making the human body cope with different kinds of stress and is an excellent anti-inflammatory, anti-tumor, anti-oxidant, and an aphrodisiac for men and women. The roots of Ashwagandha, also called Indian Ginseng helps in boosting immunity power of the body. Ashwagandha when administered in the form of a tonic provides excellent nourishment for tissues, muscles, bones, reproductive system and the adrenals. Due to its anti-stress adaptable property, it is useful in treating stress related diseases like hypertension, heart diseases, general fatigue, arthritis and diabetes. Several researches have confirmed the ability of Ashwagandha in acting as an anti-depressant without causing any side-effects. Ashwagandha is also proven to be effective in treating Asthma, Leukoderma, Anaemia, Tuberculosis, AIDS, whooping cough, piles, arthritis, and many other diseases. When mixed with milk or ghee and administered it helps in combating general fatigue in children and elders and helps in maintaining youthfulness. When Ashwagandha powder is mixed with ghee made of cows milk and consumed, it prevents sleeplessness and provides relief from back ache. The decoction of the herb is beneficial in curing tuberculosis. When Aswagandha powder and licorice is mixed with amla juice and consumed, it improves weak eyesight. Ashwagandha powder and Baheda when taken with jaggery provides relief from chest pain, and regular consumption of Ashwagandha in combination with Giloy extract and honey, provides relief from various diseases and ailments. Ashwagnadha also pacifies the imbalances caused due to vata and kapha doshas. This is also considered as a natural stressbuster. Its the most commonly used herb in Ayurvedic medicines. This herb is a very good antioxidant, antisress, anti-inflammatory and anti-tumour. 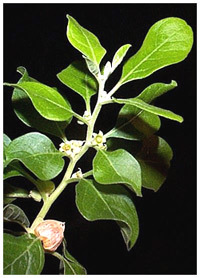 The main constituents in ashwagandha include withanolides, which can be used for many medicinal applications. Studies have indicated that Ashwagandha has anti-inflammator, anti-stress, mind boosting, antoxidant and rejuvenating properties.